The basic difference between Sterling Sleep Systems' hardside and softside waterbeds is in the frame. Simply put, the frame for a hardside waterbed is external. For a softside model it is internal. Without the wood frame, a softside waterbed can be measured and used as a regular mattress. The water bladder for a hardside waterbed is the mattress. For a softside waterbed it is in the mattress. Also, hardside water mattresses are almost uniformly high, since that is the standard height of a waterbed wood frame. Additional height may be added in the topper. But softside waterbeds come in several heights. Three common divisions of softside beds are deep-fill, mid-fill and shallow-fill. For Sterling softsides, these are 8", 6¼" and 3½" respectively. Sterling lists several deep-fill models and one mid-fill model on its site. Retailers also list one shallow-fill bed. Three of the models, 8500 Euro Top Super Waveless Waterbed, 8400 Pillow Top Waveless Waterbed, and 8300 Plush Top Waveless Waterbed, are systems: complete mattresses with comfort layers and a water bladder inside. Two of them have a pillow top or euro top. The bladders are, respectively, ER600 Super Waveless Softside Water Mattress, ER400 Waveless Softside Water Mattress, and ER9254 Waveless Softside Water Mattress. These are the softside versions of the hardside water mattresses 600SXE, 400SX, and 9254. The width of the bladder is enough narrower than the same size hardside mattress to allow it to fit between the foam rails of the softside mattress. Sterling Sleep describes the 6621 Waveless Softside Mattress as the replacement mid-fill mattress (water bladder) for the Santa Monica, a model sold by retailers. The Waterbed Doctor also shows the Sterling Sunset, a shallow-fill "flotation system." The water support in this model is 3½" water-filled tubes. These are either free-flow or waveless (fiber-filled). There are nine tubes for King size, seven for Queen, six for Full, and four for Twin. Certain of the Sterling Sleep softside waterbeds have special features. The 8500 has interchangeable parts. This is Sterling's hotel waterbed. The cover fabric is not named, but the cover is interchangeable, so consider the fabric selectable. The cover fabrics of the 8400 and the 8300 are infused with aloe vera. Belgian Damask is featured on the Santa Monica and the Sunset. On all models, top covers are zippered so they can be taken off and washed. Heaters for Sterling Sleep Softside Water Mattresses are the Calesco brand. For King and Queen sizes, there are two of them. They are dual water mattresses, and the heat can be controlled separately for each side. 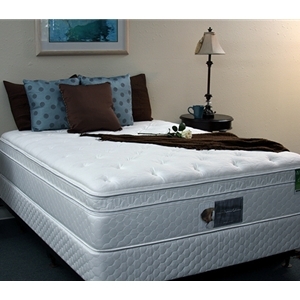 Warranties on softside waterbeds by Sterling Sleep Systems are for 20 years.